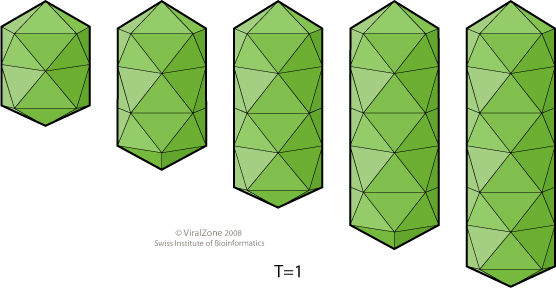 Non-enveloped capsids with T=1 icosahedral symmetry. Capsids are often bacilliform with a diameter of 18nm, and length varies from 30nm to 62 nm depending on the number of supplemental capsid discs. Segmented, linear, ssRNA(+) genome. The three segments are 0.9kb, 1.0kb and 2.8kb in size respectively. Genomic RNAs serve as messenger RNAs. The viral RNAs are translated to produce the three viral proteins. Virus assembly, each segment is encapsidated possibly individually. NATURAL HOSTS Plants: cucurbits, cherry, cassava. ASSOCIATED DISEASES OuMV: Yellowing and chlorotic spot symptoms.